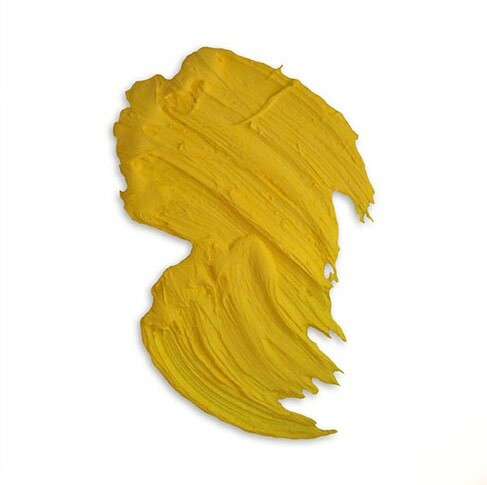 Feeling confined by the restraints of the canvas, Donald Martiny freed the gesture from traditional rectangular support. 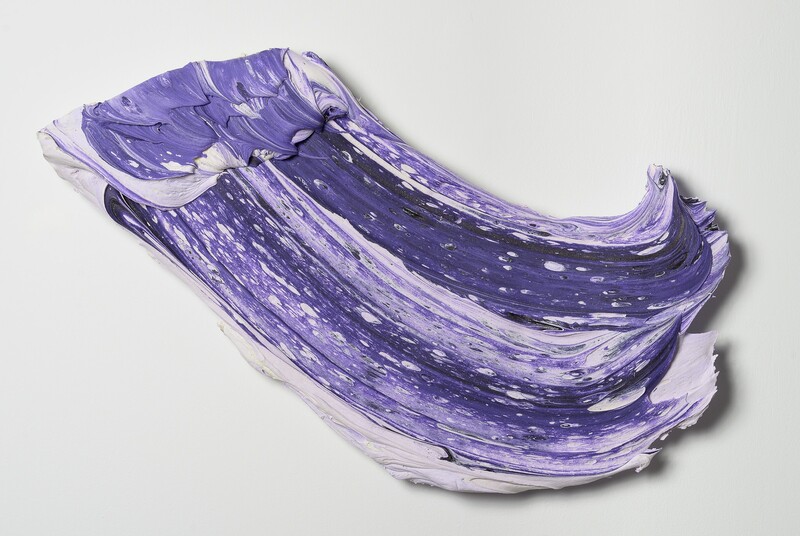 Using a mixture of his unique polymer and pigment, Martiny creates hyperbolic brush strokes, isolating movement and color as the work itself. 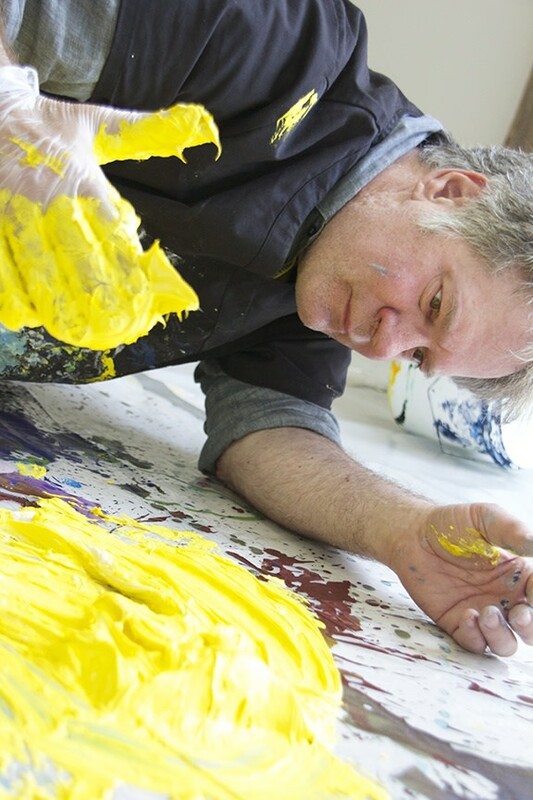 In his studio, he covers the floor in plastic so that he can work as freely as possible, using his hands, big brushes, or other tools to push his material intuitively around the space. Despite their typically large scale, the pieces offer an intimate closeness with their creator. Energy pulses from their movement and color, the fundamentals of expressionism reduced to their most essential forms. 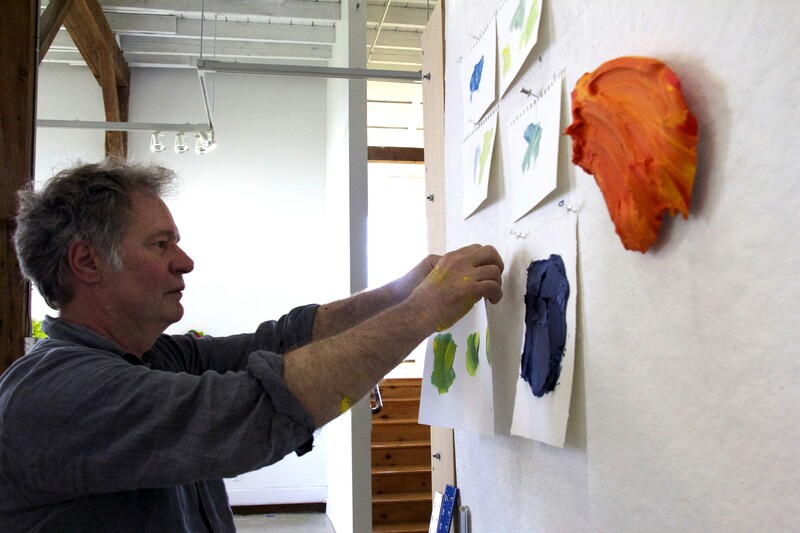 Martiny talked with us from his studio in North Carolina to discuss creating this process, the experimentation that went on in developing his materials, and thinking of these pieces as self-portraits. In kindergarten our teacher would occasionally bring out a tiny, beat-up wooden easel for us to line up and take turns painting. She was very stingy with the paint, only offering two colors at a time. 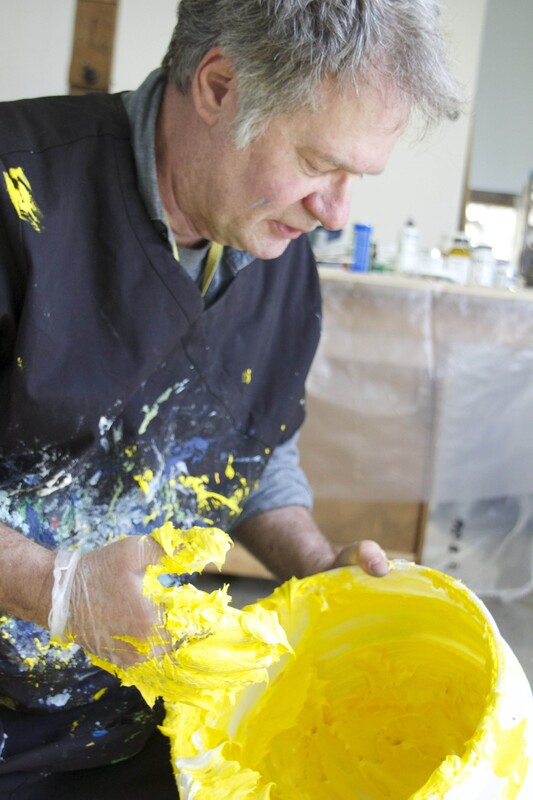 I vividly recall looking into the paint pot and seeing the amazingly beautiful, wet, pure color. I believe my initial interest in art was not inspired by images or drawing, rather it was brought about by a pure color experience. I decided very early on, in grade school, that I wanted to be an artist, not that I had any idea what it meant to be one. I recall seeing a book in the library about the New York art scene with photos of artists like Frank Stella, Larry Poons, Robert Rauschenberg, Jasper Johns and others working in their studios. I was so excited by what I saw and I wanted to be a part of that. So I immediately set out to try to see as much art as I could. Because my family did not live near any art centers, I began religiously reading art magazines and art books. I recall taking a Greyhound bus from where we lived in Michigan to Chicago to visit the Art Institute by myself when I was only 14. I was obsessed. Straight out of school I moved to New York City and enrolled in life drawing and painting classes at the Art Student's League. Whenever I wasn't painting, I visited galleries and museums and made copies of paintings I admired. I soon got a job working at a Doubleday bookstore and was put in charge of the art book department where I had the opportunity to meet and talk with many artists. I remember talking with Ellsworth Kelly in particular. He was remarkably generous with his time. Around that same time Philip Pearlstein and Jack Beal recommended me for a job working at the Allan Frumkin Gallery. What was your work like before you started these kinds of pieces? I was making academic oil paintings on canvas. I needed to prove to myself that I could draw and make a traditional painting. I thought that to be an artist I needed to make something that looked like the art that I had seen. But eventually it occurred to me that I didn't feel like I "owned" anything. I didn't feel like I was taking the conversation forward, and I didn't feel I was being honest with myself. So I started experimenting with bending and painting pieces of aluminum that would hang off the wall. I think that is when I first felt that I had found my own voice. What was the initial inspiration for creating your unique process, and how did you develop it? I'm sure there were many things but there was a moment that could be considered a "eureka" moment. Years ago while I was making little en plein air paintings for fun. I began each work by defining the working area on the canvas with a small rectangle. But when I started painting, I always went outside the lines. I wondered why I was doing that. The notion occurred to me that the rectangle was, in fact, a window or portal that I was looking through to experience the art, but when I painted over the defined border it brought the art forward into my (and the viewers) space. I wanted to make art that lived in the same space as the viewer, that created a more direct, intimate, and visceral experience. What I want to do with the paintings is to establish this relationship of now. You (the viewer) are in the moment, in front of a painting, and something happens. That is when I realized that I needed to discard the ground (canvas) and allow the brush strokes or gestures themselves to be the painting. How did you go about creating the polymer you work with? There was a lot of painful trial and error, with hours on the phone with technicians from all over the world. After years of tests and experiments, I finally started to get some traction. It is a never-ending effort to improve my materials and processes. What different concepts did you experiment with before you found what works best? My first experiments were based on my experiences building boats at Chris-Craft as a summer job in Michigan. I tried to make paint out of an epoxide mix with disastrous results. I also tried to mimic Donald Sultan's materials for a short time. That didn't work for me either. I didn't want to make a form then paint it. I wanted to be able to freely paint a gesture without any restraints. Could you talk a little about your relationship with color? Since it seems like your work is so celebratory of color itself, how do you go about choosing the color(s) for each piece? I don't see color as a political or symbolic tool. I see color as pure energy and feeling. I suppose, in a way, I see color much the same as the way Rothko saw color, except he tried to dissolve the surface of his paintings while I use the texture of the surface in a different way. I began by making monochrome works because I liked the power of the unified whole. Later I began to mix colors because I saw value in enhancing the architecture of the brush stroke. You've said that you consider these pieces to be self-portraits, in a way, because they're the embodiment of your physical gesture while creating them. Do you notice any patterns on how things like your mood or different circumstances affect your work? I put my entire self into my paintings, no holds barred. Often the gestures mimic the reach of my arms. I often use my hands as brushes. In fact, when I was asked to create two monumental paintings for 1 World Trade Center, they were both painted using just my hands. I want to be present in my work, not because of my ego, but because I want to create a personal relationship with the viewer. A long time ago, I noticed that when looking at paintings we often step up close to examine the works, to see the brush strokes, the way the paint was applied, to imagine the artist at work. Was he/she right or left handed, did they paint from the wrist or from the shoulder, what size brush did they use, how much medium did they mix with the paint, etc. By making oversized brush strokes, the viewer is already up close and can experience the painting in a more intimate way. I believe this offers the viewer the opportunity to participate in the painting rather than just view it. I feel I have discovered a new language and am just learning to speak. There is so much to explore and do. The work needs to lead the way. The work tells me what comes next. 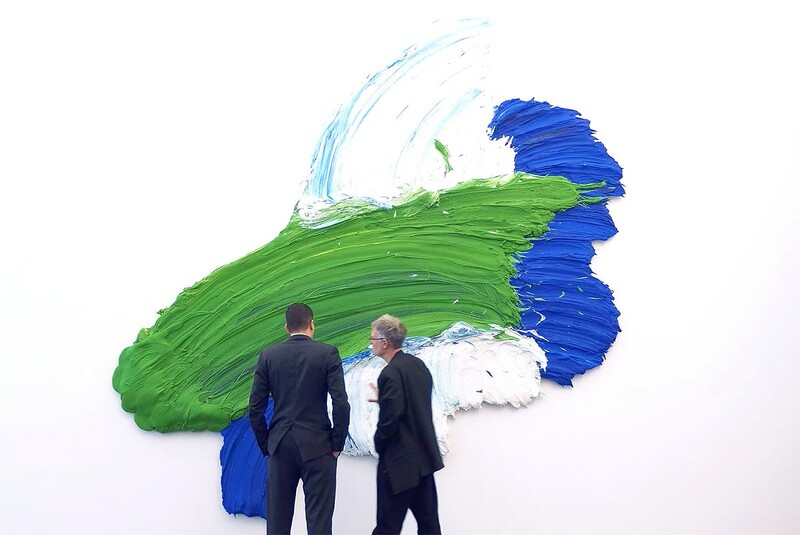 Explore more of Don Martiny's work here.